Many of us have heard some of the spooky 3:16 connections with Tebow’s next-to-last game this season. The Broncos beat the Steelers on January 8 in Tebow’s first NFL playoff game, with Tebow throwing for 316 yards. 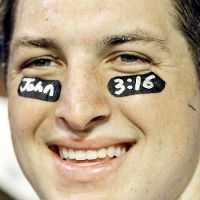 This was three years to the day that Tebow made a public splash wearing eye black that read “John 3:16” in the BCS Championship game. In the win against the Steelers, Tebow averaged 31.6 yards for each pass completion, an NFL record for postseason games. Let’s do the same kind of analysis on Eli Manning’s Super Bowl win on Sunday. He threw a total of 296 yards. There is no book in the Bible with the verse 2:96, so the significance must instead be in verse 29:6. Several books have this verse. Maybe this represents Manning being declared the game’s MVP. This may represent the accolades he received after the game. That’s more like it—some godly justice! God is obviously furious with the results of the game. I’ll bet he was a Patriots fan. That’s a big claim appropriate for the year’s biggest game. Still, I wondered if there was more. I realized my error when I converted yards into the biblical measure of cubits. There’s a bit of fuzziness in the definition of the cubit, and 296 yards becomes something in the range 511 to 518 cubits. Since Tebow’s quote is from the New Testament, let’s look there for verses in the range 5:11–18. Mark 5:11–18 is the story of demons cast from a possessed man into 2000 pigs. In Luke, it’s the story of Jesus healing leprosy. In John, Jesus gets into trouble with the Jewish leaders because he heals on the Sabbath. James and 1 John both state that prayer heals sick people, and they make a causal connection between sin and sickness. The message starts to take shape—something about mental and physical illness being caused by sin and demons. The breakthrough came when I went back to the quarterback’s name—Eli Manning. That’s Elisha Manning. Of course—the Old Testament prophet Elisha! it wasn’t the New Testament but the Old Testament that had the clue. And there it was, in 2 Kings 5:11–18, the story of Naaman, a general from Aram (today’s central Syria), who had leprosy. The scales fell from my eyes. God’s message in this Super Bowl is that he can cure leprosy. Leprosy is now reliably treated with antibiotics, of course, so this isn’t especially relevant, but it’s good to know that God’s still concerned about diseases that have little or no impact on society today. I know what Christian apologists will say about my analysis. They’ll say that this is arbitrary, that I’m just picking and choosing verses based on what I want to find, collecting ridiculous passages and ignoring the rest. They’ll say that the chapter and verse divisions are not divinely inspired, with the New Testament being divided into verses only in the 1500s. They’ll say that this entire analysis is nonsense, built on nothing solid. Busted! You got me. That’s exactly what I was doing. I was indeed picking verses with an agenda. But then if it’s nonsense when I do it, why is it any more meaningful when Christians do it? This entry was posted in Christianity, Humor and tagged Broncos, Eli Manning, Elisha, Giants, John 3:16, Leprosy, Patriots, Steelers, Super Bowl, Tim Tebow by Bob Seidensticker. Bookmark the permalink. It’s no different when you cherry pick verses than when anyone else does it. Wrong. See—we agree again! Christians don’t need to do this to answer your concern, so if they do, feel free to point it out. You sir, are my new fan. Fantastic post. I wonder what other areas of life we could apply this to? Speeding tickets, electricity bills, the amount of time it takes to cook a roast chicken? I doubt it would be any more accurate than reading animal entrails, tea leaves, or the patterns in the shell of a tortise. Pareidolia is the tendency to interpret a vague stimulus as something known to the observer, such as interpreting marks on Mars as canals, seeing shapes in clouds, or hearing hidden messages in reversed music. It is a subset of apophenia, the spontaneous perception of connections and meaningfulness of unrelated phenomena, such as finding significance in such random things as automobile license plate numbers, birthdates, and arrangements of fallen twigs — and especially numbers. A=1, and so on) and it totals 40, as in 40 days of rain. Of course, on the other hand i live in Seattle, so maybe there’s nothing significant there after all. Sum the letters in your full name and hope that they don’t add up to 666!